Many users have noticed that turning off autocorrect in the Mac OS X System Preferences does not impact every single app on their Macs. Two cases in point where autocorrect stays on; Pages, the word processor app from Apple, and TextEdit, the default text editing app that comes with all Macs. That’s it, autocorrect in Pages will stay off for all documents unless you re-enable it again at some point. You don’t need to relaunch the app or anything, the change is instant and can be reversed simply by selecting the “Check Spelling Automatically” option from the same menu again. Remember, this is irregardless of the universal System Preferences option in Mac OS X, so you can have that set to either be on or off and it does not matter to the Pages app. This is helpful for many reasons, but it’s particularly handy if you use TextEdit as an HTML source viewer or editor to avoid autocorrecting code. It’s important to note that choosing to leave “Check Spelling While Typing” enabled will not cause the autocorrection to occur, instead it allows for detected typos and errors to be found, simply underlining them in red text, rather than replacing them automatically. This is generally recommended for most writers and authors since it helps to flag errors, though sometimes it will flag things erroneously. Thanks to one of our many brilliant readers for the tip idea! I wish there was a way to turn off auto-correct in Mac MAIL program. I’ve got one setting for “check spelling” to NEVER, yet it still pops in trying to correct something I don’t want corrected! 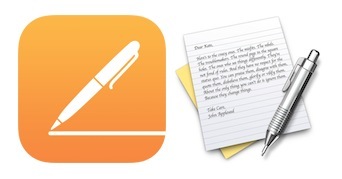 Can you offer a tip for changing the default email app on the mac from ‘Mail’ to Sparrow, etc.? Your video was too quick to follow except for freeze framing. And it did not answer my question. I am using gmail but not Google chrome. There is no option available to change the default mail server? Turning off autocorrect in Pages app for Mac will not impact your Mail servers, or Gmail, or Chrome. This is for Pages. Is there a way to keep auto capitalizations of words at the beginning of sentences or of ‘i’ to ‘I’ while still shutting off the other autocorrect functions–particularly the suggestion text box? 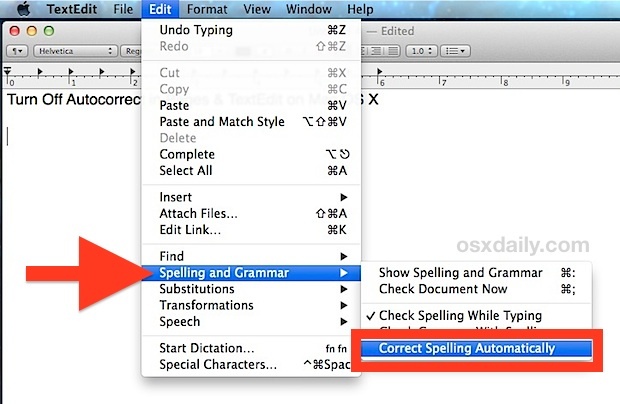 I can uncheck/de-activate spell check and auto correct in TextEdit… BUT, I have to do it EVERY time I open a document! And since I open TextEdit documents about 20 times per day, that is a LOT of resetting! Why doesn’t the preference setting stick? Ironic you talk about spell check and you use a word like irregardless. That’s funny right there. Likewise! Too bad turning off autocorrect/autocomplete also means turning off spellcheck! So a couple of issues here with your claims at knowledge here. Autocorrect tends to imply that an improvement or correction will be made without any further action or input from the user. Talking about highlighting spelling mistakes is no where near what autocorrect does or means. Have you ever used MS Word?? That’s real autocorrect. My typing “teh” would not even be possible for you to see because it’d autocorrect to “the”. Did you even bother to read the article before you commented? It clearly states you can have autocorrection switched on or off (which would correct ‘teh’ to ‘the’ for example), or simply to display a red underline on misspelled words, without correcting. It’s your choice. (As an additional feature, autocorrected words are remembered. They are briefly underlined with dark blue dots to denote a change has occurred. If you then right click on the word, you are given the option to change it back to the original version – useful if the software tries to be over-clever with words it doesn’t know). By the way, “irregardless” may be a non-standard word but it has been used in print since the late 18th century, so scoff away if you like but it has precedence. Regardless, as you point out many people have made this mistake and it’s nothing to be ashamed of. Also thanks for writing this article, I know I would make many (probably grammatical and substantive) mistakes if I had attempted it. Twenty years ago, the answer to anyone writing or saying “irregardless” was “That is not a word.” sadly, many dictionaries now list it. They have succumbed to the pressure of wrong usage rules. Actually, most people would say they “could care less”. I’m fairly sure multiple question marks at the end of a sentence are grammatically incorrect. It’s kind of funny that you got all upset over a single word then made another mistake trying to correct it. AND then made another mistake… Then is not a conjunction; it only refers to time. im a new to macbook.. I’ve been using other laptop brands and I’m used of having microsoft word than pages.. i just wanna ask how to disable the auto.bullets on pages..
i always end up continuing my bullets from the last from the form i use. instead of 1,2,3 it will continue to a, b,c.. pls help.. I have autocorrect switched on globally and also in each individual piece of software, but I am wondering if Pages uses a different dictionary or set of rules? For example, in all other apps, I get autocorrection for a large variety of mistakes including switched characters and typos. However, in Pages, many of these corrections aren’t made automatically. For example, both Safari text boxes and Pages would correct “amd” to “and” but only Safari corrects “APple” to “Apple” or “cmoputer” to “computer”. Cool! Thank you sooooo much! Thanks for revealing this weird location to change a “preference”. This sort of arbitrary switching things around in menus (the Export option is now under the File menu instead of the Share menu) is one of many reasons PC users think OS X is not good.